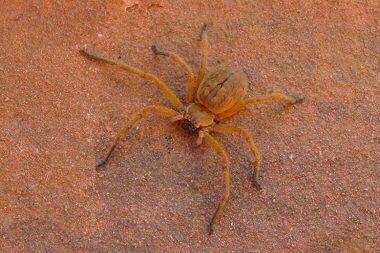 The Giant Crab Spider is one of the largest spiders you'll see in the deserts of the southwest. It has a body to 1" in length or more and a leg span to 3". It's color is light brown with a dark, Y shaped marking on the top of its abdomen and dark fangs in front. Like other crab spiders, it often holds its legs at right angles to its body. This spider occasionally is seen on walls or ceilings of houses (unlike wolf spiders and tarantulas that do not climb). The giant crab spider walks around in search of insect prey at night, but usually hides during the day. Despite its appearance, the giant crab spider is not dangerous to humans (though the bite can be painful). Crab spiders get their name by their ability to rapidly move sideways, like a "crab". Giant crab spiders are found throughout Arizona and Sonora in a variety of habitats including: in dead saguaros, under rocks and in homes.